Archives : DEEPAWALI SPEIAL. PRIMARY BULL MARKET TO ONTINUE - 29/10/2010. DEEPAWALI SPECIAL. PRIMARY “BULL” MARKET TO CONTINUE - 29/10/2010. Compared to last Deepawali we are up by almost 2700 points on the Sensex and 850 points on the Nifty. A major part of last year i.e. the period from last October 2009 to August 2010 was spent in a small range; consolidating the gains made earlier. Nifty was compressed in a small range of 5300 to 4800 over 10 months, before giving a strong upward breakout. The market shot up almost vertically after the bullish breakout as the Nifty went up to around 6200. The market has currently paused for breathe and the upward journey is likely to continue after that. WEEKLY OUTLOOK – 29/10/2010. MARKET REBOUNDS FROM SUPPORT - 29/10/2010. Both Sensex and Nifty took support at the zone indicated in the last week’s article. Sensex rebounded from 19768 (Support zone was 19771-19695) and Nifty took support at 5937 (Support zone was 5932-5926). Both the indices have formed a bullish reversal pattern on the daily charts and the reversal will remain in force as long as the Sensex stays above 19768 and Nifty above 5937. INFLOWS TO CONTINUE NEXT YEAR. The market is within striking distance of the all time high levels recorded in the year 2008 i.e. Sensex 21208 and Nifty 6357. The market has gone from strength to strength this year even as the global markets underperformed. Our market has outperformed major markets massively, as many global markets are still struggling to come out of their Bear market, whereas we are almost at the all time high levels. The actual decoupling between the US and our market has happened. Even considering the FII inflows in emerging markets, it seems that India is the first choice destination to park global liquidity. MANAGING GROWTH OVER CONTROLLING INFLATION. The market will be watching at various factors in the next year, but the most important factors besides the corporate performance will be global liquidity and RBI’s stance. Assuming strong corporate performance and high global inflows, the stance taken by the RBI will hold the key. Last year as the growth picked up, RBI’s focus shifted to control inflation. Controlling inflation took precedence over growth. But now the rate of growth has diminished somewhat and hence RBI’s focus will shift to managing growth over controlling inflation. Both Sensex and Nifty are continuing on their journey to achieve the target for the Bullish Inverted Head & Shoulder pattern formed on the weekly charts. The targets for the same are Sensex 27773 and Nifty 8344. The above targets will be achieved as long as the Sensex continues to stay above 15330 and Nifty above 4538. For the short term, both the indices are undergoing a Bullish Flag consolidation formation and the target for the same after the breakout is likely to be Sensex 22803 and Nifty 6873. On the lower side both the indices are supported by Gann angle Trendlines. The support for Sensex is at 18669 and for Nifty it is at 5692. If these Gann support levels are breached then the next Gann support will be at 15069 for Sensex and 4563 for Nifty. For the year ahead, Sensex will face Resistance at 22292-25032-27773 and Support will be at 18314-16684-15330. For the Year ahead, Nifty will face Resistance at 6777-7560-8344 and Support will be at 5545-4984-4538. The Sensex opened the week at 20199, made a high of 20452, a low of 19768 and closed the week at 20032. The Sensex lost 133 points on a weekly basis. Similarly Nifty opened the week at 6101, made a high of 6151, a low of 5937 and closed the week at 6017. The Nifty too closed with a loss of 49 points on a weekly basis. 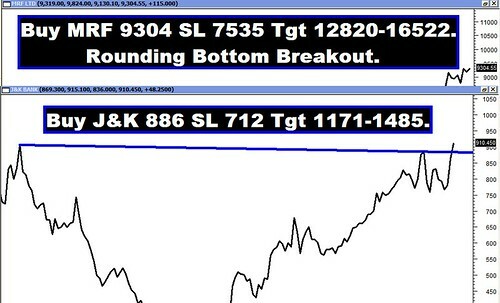 Sensex has formed a Bullish Harami reversal pattern on the daily charts on Thursday and Friday. On Friday, the Sensex has formed a small white body with a long lower shadow which is indicative of the buying pressure at lower levels. Nifty too has formed a bullish reversal pattern called Bullish Harami Cross on the daily charts on Thursday and Friday. On Friday, there is a Doji formation on Friday, which has a long lower shadow, indicative of the buying at lower levels. On the weekly charts, both the indices have formed a small black body candle almost like a neutral formation. As the market is below the 20dma (Sensex – 20261 and Nifty – 6093), the short term trend is down. At the same time both the indices are well above their 50dma (Sensex – 19543 and Nifty – 5876) and 200dma (Sensex – 17844 and Nifty – 5352) and hence the medium and long term trend continue to remain positive. In the current upmove both the indices have rebounded from Sensex 19771 and Nifty 5932 and in the process have registered higher bottoms. 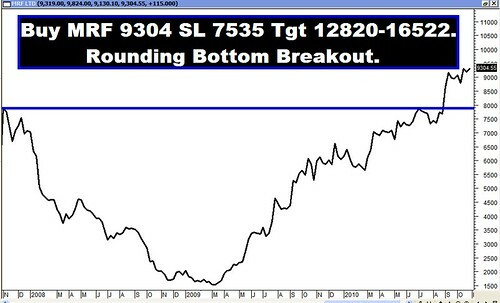 Sensex has formed higher bottoms at 19771-17819 and Nifty has formed higher bottoms at 5932-5348. The short term uptrend will be in danger only if both the indices close below their higher bottoms i.e. Sensex – 19771 and Nifty – 5932. This week both the indices have tested their higher bottoms without breaching that support and hence the short term uptrend remains intact. The long term trend will remain intact as long as Sensex 17819 and Nifty 5348 remains intact. The correction is likely to continue only if the Sensex and Nifty close below the lows made during the week, i.e. 19768 for the Sensex and 5937 for the Nifty. If the market closes below the above mentioned levels, then we will see a correction of the recent rise i.e. from Sensex 17819 to 20854 and Nifty 5348 to 6284. In that case, the correction levels for the Sensex are at 19695-19336-18978 and Nifty 5926-5816-5706. In case the market corrects, it is likely to take support at the 38.2% retracement level i.e. at Sensex 19695 and Nifty 5926, which is almost coinciding with the previous higher bottom at Sensex 19771 and Nifty 5932. Expect strong support to emerge between 19771-19695 for the Sensex and between 5932-5926 for the Nifty. This week the market rebounded from the above mentioned support zone. Majority of the oscillators are giving Sell signals except may be for RSI which is just above 50. MACD continues with its Sell signal even though in positive territory. The Stochastic oscillator has just given a Sell signal as %K has cut the %D line from above. The ROC has given a Sell as it has turned negative. ADX is at 30 indicating that the current uptrend is losing strength. MFI and OBV too continue with their Sell signals. The OI PCR is at 1.15 which is just about average. Options data suggest that highest Call writing is at 6500 and Put writing at 6000. In short the Nifty is likely to move between 6000 on the lower side and 6500 on the higher side. Sensex has Trendline Support at 18973 and Trendline Resistance at 20848. Nifty has Trendline Support at 5697 and Trendline Resistance at 6282. For the week ahead, Sensex will find Support at 19870-19695-19543 and will find Resistance at 20267-20461-20706. For the week ahead, Nifty will find Support at 5968-5925-5876 and will find Resistance at 6093-6151-6223.